The very first thing I baked that was not a disaster was an apple pie. I was 20 and a university student studying at CARIMAC, on UWI’s Mona Campus and lived in a cosy apartment with minimalist 80s furniture in the 2001. It was my final year and I held down three part time media jobs while I took an extra course load so that I could finish my studies ahead of time. By day I was a full-time student, and during weekday breaks, nights and weekends, I was the prime time news weather reporter, the morning radio magazine producer and lotto draw host. I had a full life. It was shortly before going off to university that I developed a passion for food and for cooking. Before then, my interest was restricted to hours of poring over my stepmother’s cookbooks and experimenting with juices and salads. In a Jamaican home, a teenage girl is expected to make a contribution to Sunday Lunch – or Sunday Dinner as we call it – usually in the form of making fresh juices from fruits in season or salads. On the Sundays when I managed to get away with not going to church – another must in many Jamaican homes- I was required to “keep an eye on the meat” which would usually be a pot roast that would need to be turned and a little water to be added at intervals. During these years, I never opened the oven. The oven was dark, hot and scary and I had no interest in it. I would experiment over a charcoal stove but never in an oven. That was until I had one of my own. There is something about baking that speaks to the most loving and nurturing aspects of feeding people. Maybe it is the apron, the flour all over you and the oh-so-cute oven mittens but baking for me is an entirely beautiful and ultra feminine experience. No offence to my many male friends who bake or are themselves pastry chefs, but for me, homemade sweet treats made by the woman of the house are simply sacred. 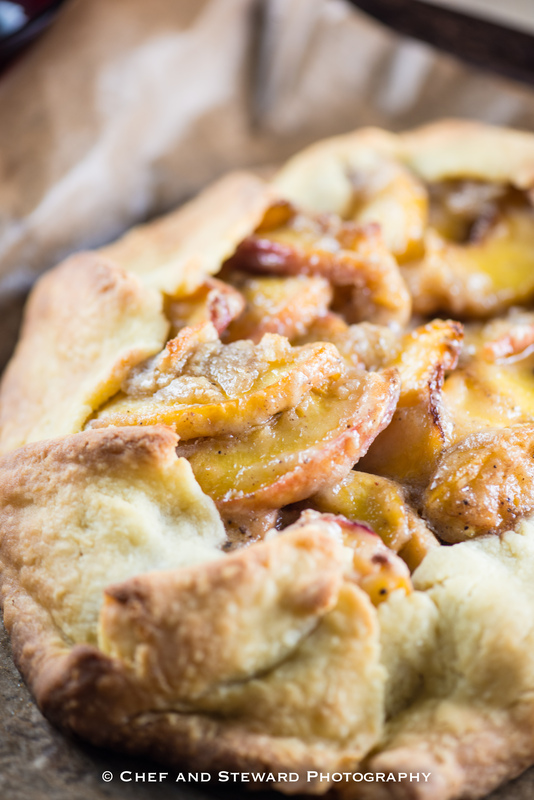 As and ode to the changing of the seasons, I made a Peach Crostata (summer) and an Apple Cinnamon Galette (autumn). 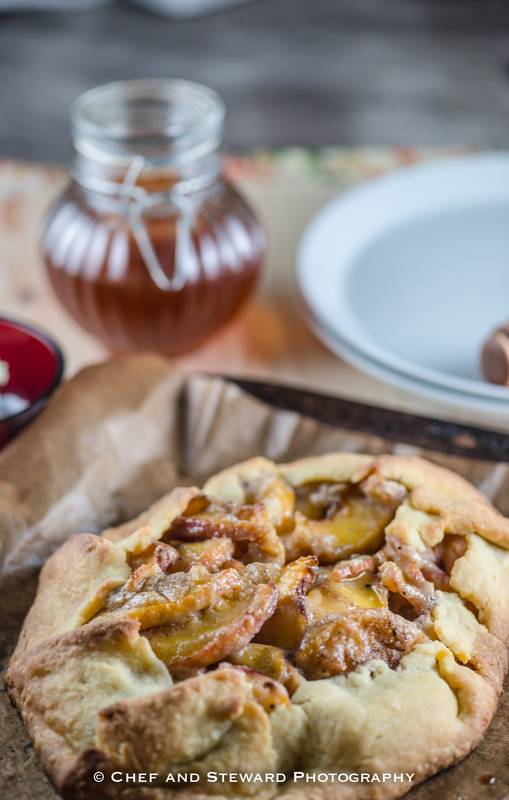 It was the Apple Cinnamon Galette that spawned the wave of nostalgia above. “Crostata” is Italian for a rustic free form pie and “Galette” is French for the same. The dough yields two so you can call them either one you wish. Place flour, salt and sugar in a food processor and pulse until combined. Take out of the flour mixture and toss the 1/2 pound butter cubes in it until coated. Dump all back into food processor. Pulse until butter is the size of peas. While motor is running, add all the iced water at once through feed tube. Keep pulsing to combine, stopping before the dough comes together. Remove the bowl from processor and the blade then place the dough on a well floured surface. Form into two balls and wrap each in cling film (plastic wrap) and refrigerate for about 3 hours. Once pastry is chilled, remove from refrigerator. Combine the ingredients of the filling. Roll the pastry dough out to a circular shape on a well floured surface to about 11 inched in diameter. Work quickly so that the butter does not melt too much as it will get very sticky. Transfer dough to a parchment lined- baking sheet. You will need one baking sheet per crostata. Place filing in the centre, leaving about 1 .5 inch around the edges. Fold edges over the top lapping over as illustrated in the pictures. Bake for 30-40 minutes until golden brown. CHEF’S NOTE: My lovely wife baked both of them but only one made it to her photo “studio.” I still don’t see why she is making a fuss about the other one because to me they look the same. The difference is not in the look of them, but the taste and quite frankly my belly agrees. The short story is that it just took a detour on its way to the studio and again, my belly agrees. 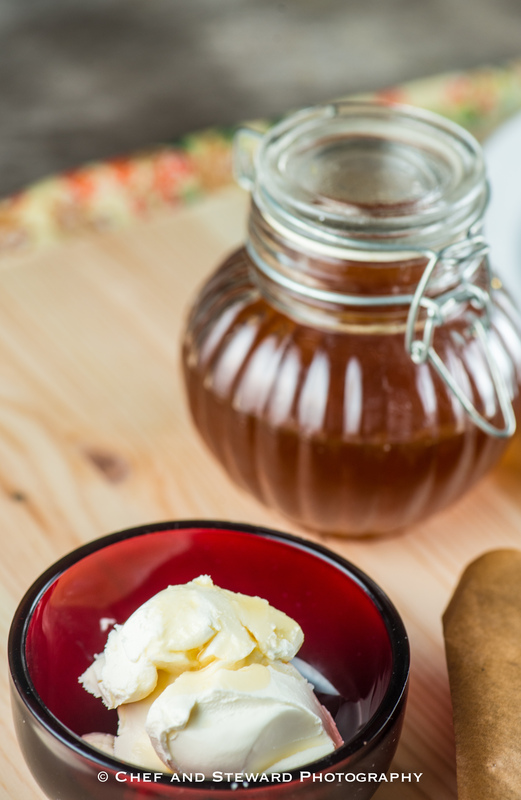 Serve warm with cream or Mascarpone cheese drizzled with honey. Such timely post, I have peaches in the fridge and its waiting to get some yummy pampering. I don’t need to cook the filling right? Just mix? Thats right Abigail… no need to cook filling. This makes for a lovely texture as well. Love love love this recipe! I’m a big apple pie lover, but so intimidated by making the perfect pie crust. 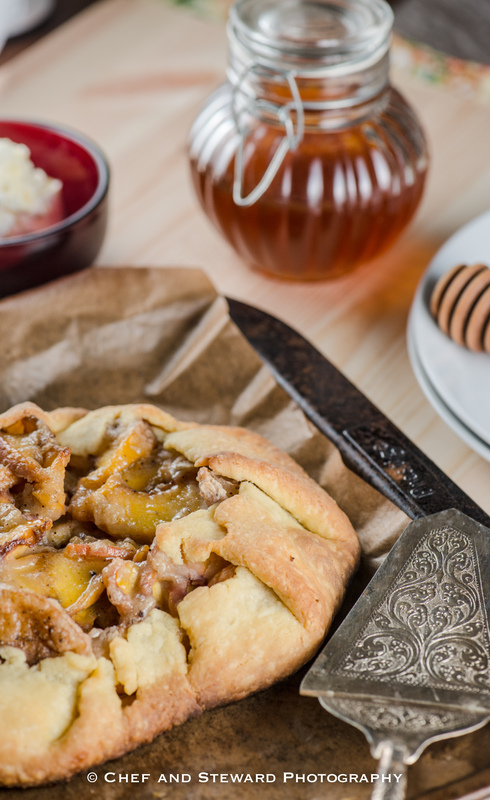 I love the idea of an apple cinnamon crostata with the dough being folded over the filling. Feels way more doable. This recipe is a keeper! This looks really delicious. I am not the biggest apple fan but this is definitely worth trying. The combination of the apples, brown sugar, cinnamon, and cheese & honey is sensational. Sometimes you might not like how one ingredient feels in your mouth but tasting them in the right combinations can take you to another level! love the nostalgia, it makes the crostata come to life even more. Francine, it wasn’t deliberate or contrived. I just sat and it came out… I was a bit hesitant as to where it was all coming from at first but I just went with the flow. Happy you liked it! Thanks Shyzie! Do come back and tell us how it goes! The pears will do just as nicely MJ! The photography looks delicious! Great way to use up extra fruits! You indeed live a full life! I am a huge fan of apple desserts and this looks tasty. I love that its rustic and free formed. I do! I give thanks for that daily…didn’t realize it started so early until I wrote this post. It is divine. I used fresh cinanmon bark from Zanzibar that I ground specifically for the pie so it was amazingly spectacular! The mixture of apples creates a lovely and diverse texture making every bite a little different. I’ve never had galette or a crostata before, but this looks soooo good that I’m going to have to try it! Also, bravo on being able to manage THREE jobs while being a college student. Wow! I thought I was busy! Keisha, you will be really amazed at how much you will like it and how much you will make it a constant go-to dessert with fruits in season. 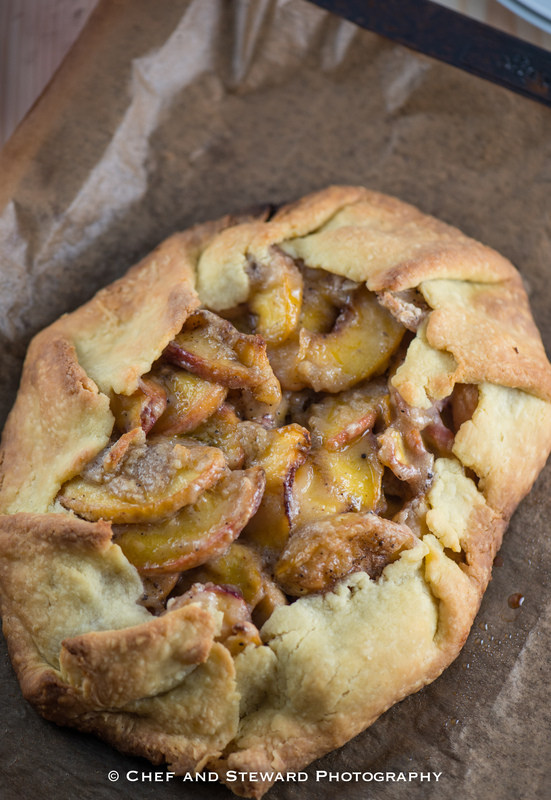 I’ve never made a galette before, but this looks really delicious.